Chantal Akerman, the Belgian film director, was having trouble raising funds for a musical that took place in a shopping mall. She gathered together the cast, and made a demo film, sort of a sketch of what the finished product would be, in which the players sang the songs and read the dialog with no locations or production values whatsoever. This sketch was well received by film festivals, won prizes, and resulted in funding of the originally conceived picture. The more conventional film went unnoticed, despite its bigger budget and more elaborate production values and technical effects. I tell the story because I feel that Imanol Caneyada has done something similar in his “novela negra” Tardarás un rato en morir. At first, I was disconcerted by the wide range of topics, locations and characters he covers in this short novel. The first person narrative of the aide to a disgraced former Mexican state governor hiding out in Montreal takes only slight precedence over the story of a Montreal police detective trying to solve a series of bizarre murders. We get the back stories of not only the Mexican main characters, but also the Montreal policeman, a surgeon and his staff, a hotel employee and a most-wanted drug cartel chief. After a while, though, I realized just how ambitiously large the book was, and came to admire how concisely the author managed to show how the search for a Canadian serial killer can put the Mexican drug wars in context. The theme I came away with is that nothing is really as it appears on the surface – personal relations, physical appearances, headline news, crime, national identity, political power and financial success included. The peaceful blanket of the constant snow in Montreal provides an apt metaphor. An interesting book that could have frustrated me with its refusal to dig deeply into any of its characters or their stories, but that covered such a wide range that I came away satisfied. En esta impactante novela negra, Imanol Caneyada retrata con crudeza un mundo en el que imperan el poder del narcotráfico, las mentiras, el crimen, la corrupción, los asesinatos y la violencia. A través de una trama envolvente y personajes delineados con exactitud, Tardarás un rato en morir nos cuenta la historia de un ex gobernador mexicano y su fiel ayudante, quienes deben partir en secreto hacia Canadá. Su exilio es la única manera de rehuir el callejón sin salida en el que se encuentran: terminar en la cárcel o ser alcanzados por uno de los más temidos capos de la droga, que busca vengarse de ellos. Por otro lado, la ciudad en la que se esconden tiene sus propias historias perturbadoras. La nieve que cubre esas calles, supuestamente idílicas, se cubre de sangre, pues empiezan a desaparecer mujeres, a las que encuentran asesinadas y destazadas con métodos brutales. Con un ritmo cada vez más intenso, la narración del ex gobernador relacionado con la mafia se entrelaza con la del asesino serial que siembra la desazón y el terror. 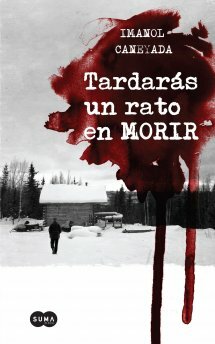 El resultado es un thriller con una intriga bien lograda y una visión ácida de la realidad, que enganchará a los lectores. This entry was posted in Novelas Mexicanas and tagged Canada, Chantal Akerman, Mexican drug wars, Mexican literature, Mexico, Montreal, police investigations, serial killings by brucecritchley. Bookmark the permalink. Cool! Pretty sure I haven’t seen it. Pingback: MANUEL MÚJICA LÁINEZ (ARGENTINA,1910-1984) | "LA CASA DE LAS VENTANAS"
Pingback: MANUEL MÚJICA LÁINEZ. (ARGENTINA,1910-1984) | "LA LIBERTAD ES PARA SOÑARLA"
Pingback: MANUEL MÚJICA LÁINEZ. (ARGENTINA,1910-1984) | "LA VIDA DE UN LITERATO"
Pingback: MANUEL MÚJICA LÁINEZ. (ARGENTINA,1910-1984) « "EL ÁRBOL DE JM"